Residential | Frye Roofing, Inc.
Time for a new roof? 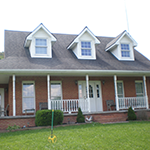 We are proud to serve the homeowners of the Virginias with premium residential roofing services. Whether you need a repair, replacement or new install, we’re here to make sure the job is done right! Frye has a “Master Elite” roof installer status with GAF. This status is special, less than 2 of each 100 professional (2%) roofing contractors in the country meet the professional qualifications and commit to the superior standards required to become certified.